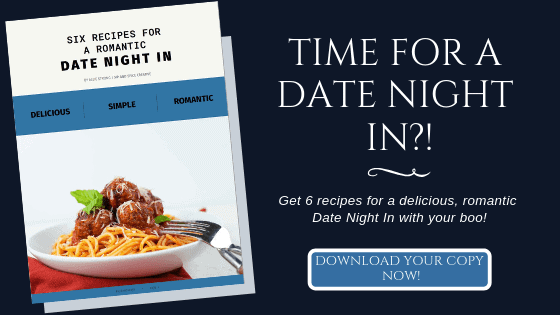 Looking for a fun, easy date night recipe? I’ve got you! 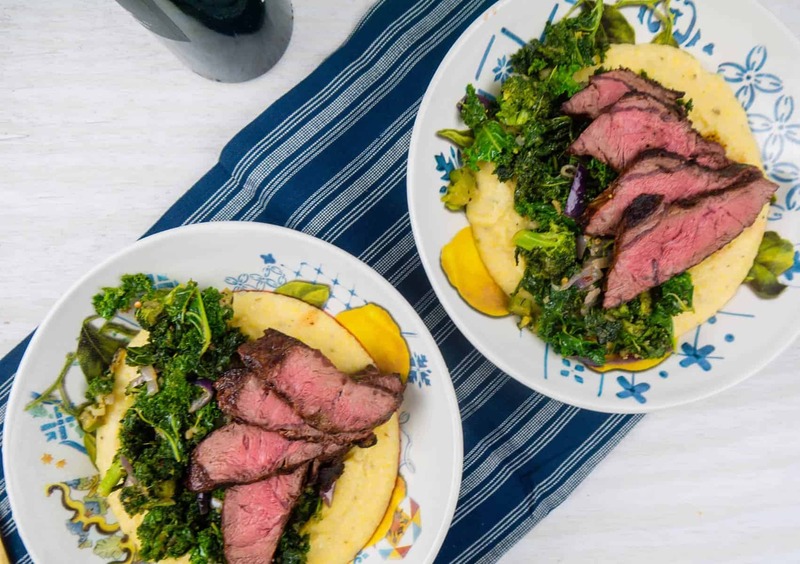 This Cheesy Polenta with Grilled Steak and Garlicky Greens is just what you’re looking for. Stay-in date nights are our jam. We love getting a little creative in the kitchen, pouring a couple glasses of wine, blasting music and working together to make a meal. We usually split up the work in parts. Luke always takes care of the meat especially if we’re grilling and I usually handle the veggie side. We help each other season our components, sing and dance to the music (which is anything from Pearl Jam to EDM to 90s Britney), taste as we go and laugh a lot. Especially once we get to the second glass of wine! If you’re not used to this kind of date night, I highly encourage you to give it a try! It’s so much fun, the wine’s much cheaper and you have be 100% sillier than if you were out at a restaurant. 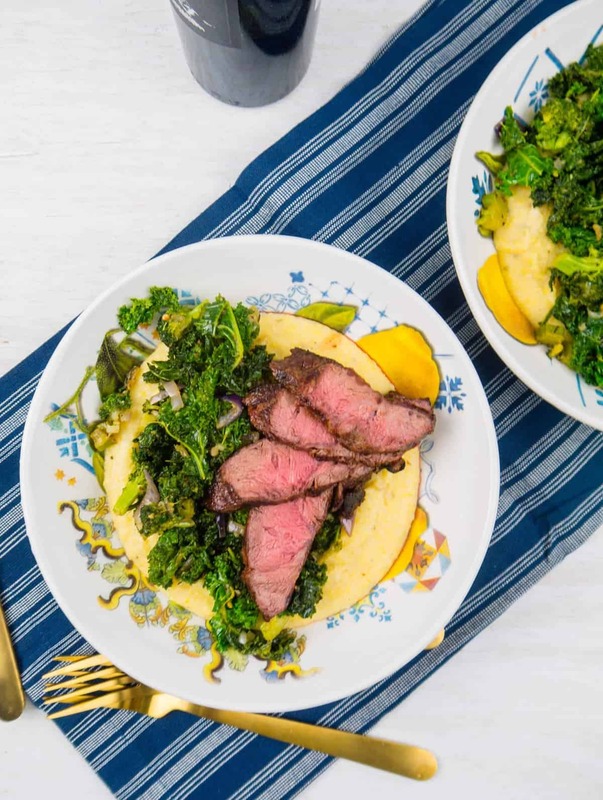 And this Cheesy Polenta with Grilled Steak and Garlicky Greens is a perfect recipe to start with. It’s hard to mess up and easy to split up—put 1 person in charge of the steak and the other in charge of the greens. The polenta cooks up so quickly that you can tag team that as you near the end of cooking the steak and greens. Then grab a spoon and taste together as you go. Take another sip of wine. In a large saute pan, heat the olive oil over medium heat. Add the crushed garlic and red pepper flakes and let cook 1 minute. Add the onion and broccoli and cook for 3 minutes. Toss in torn kale and stir. Let cook for 10 minutes until fully softened. In a medium saucepan, bring the chicken stock, polenta and 1 teaspoon salt to a boil. Lower to a simmer and whisk often until fully thickened. Meanwhile, season the steak with a sprinkle of salt and pepper on both sides, then grill for 3-5 minutes on each side until cooked to medium. Remove from the grill, cover with foil and let rest for 5-10 minutes. Once the polenta is thickened, add the black pepper, shredded cheeses and cayenne and stir until cheese is melted. Slice the steak against the grain. In shallow bowls, serve up a big ladle-full of cheesy polenta, then top with a big helping of greens and a few slices of steak.